The ruling to dissolve the United Progressive Party may be bad for democracy in the short run, but could help progressive politics in the long run. Politics, democratic or otherwise, is a field of contention. South Korean politics, democratic or otherwise, is as contentious as they come. On December 19, the Constitutional Court in South Korea ruled to disband the hard-left United Progressive Party (UPP). Eight out of nine judges decided that the UPP was a genuine threat to democracy in South Korea. The ruling comes after Park Geun-hye, the National Intelligence Service, and the Justice Ministry filed a suit with the court asking it to consider disbanding the party following the conviction of former UPP Assemblyman Lee Seok-ki and a group of his acquaintances on charges of espionage. The mainstream left-right perspectives on the issue highlight its paradoxical nature but overlook the silver lining in what many see is a very dark cloud. The domestic response to the ruling was quick and predictable. The lead column at the left-leaning Hankyoreh the day after the ruling reads: “Democracy’s Death, the Constitution’s Death.” The English translation at Hankyoreh’s website (which uses a different title) lays out the mainstream position on the ruling and the logic behind the position. Hankyoreh wastes no time getting to the heart of the matter. The first paragraph is an unabashed blast at the court (and the Park Geun-hye administration). The decision [to disband the UPP] was not based on any real evidence or definitive proof. It was a death sentence handed down on a small party for no other reason than that people didn’t like it. It was an utter repudiation of democracy, an institution founded on the core values of tolerance and diversity. Today, South Korea’s hard-won democratic system, the result of decades of struggle, now stands faced with the threat of disbandment and disintegration. “That people,” of course, is a reference to Park’s administration and the judges who agreed that the UPP’s real political mandate was to violently overthrow the democratically elected South Korean government and replace it with a political system like that of North Korea’s. Hankyoreh, and several others (see here, for one example), disagree that the UPP was anything other than a minor leftist party with a platform based on “democratic progressivism” and a commitment to representing (largely unrepresented) labor. And while Lee Seok-ki’s group may have been involved in planning anti-state activities, Hankyoreh argues that “you can’t equate them with the activities of an entire party with some 100,000 members, “ which the Constitutional Court did, even though the Supreme Court has yet to uphold or overturn to the original verdict. While it is true that the UPP has been under the microscope for electoral irregularities and likely harbors/harbored lawmakers with genuinely pro-North Korea political views, one wonders whether the disbandment of a fringe left party does more harm than good to South Korea’s democratic order? The freedom of political association and expression are anchors of any democratic society, and these principals were arguably undermined by the court’s decision. It does not help that the court’s decision comes amongst a host of other scandals that many see as undermining South Korea’s democratic order. 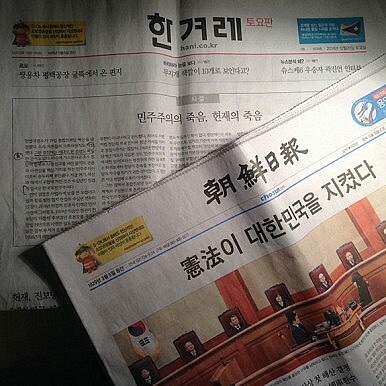 The defamation cases brought against reporters at the Segye Ilbo and the National Intelligence Service election interference scandal are a couple of examples, among others. However, despite the damage (big or small) this does to the democratic order, unless one believes the Constitutional Court is not acting as an independent judiciary apparatus, the ruling itself is the product of the democratic process and ought to be, as one Korea expert noted, respected. Such are the paradoxes of politics. For those who find themselves in the same camp as the Hankyoreh, or maybe those just outside their high emotional campgrounds, there is the proverbial silver lining to the dark cloud. The dissolution of the UPP may actually help “normalize” liberal/progressive politics in South Korea. As noted in previous articles (see here and here), the main liberal party (currently the main opposition New Politics Alliance for Democracy, or NPAD) is in many ways mired in a past era and is increasingly incapable of connecting with younger voters. Despite the UPP’s fringe status, NPAD is grouped together with UPP as representing “progressive” party politics in the post-Sunshine era. That is not particularly good for the mainstream party. Moving beyond anti-authoritarian ideology and various other “struggles” will open an avenue for a more serious discussion of actual progressive issues, such as welfare state expansion, income redistribution, and important social issues (e.g., LGBT equality). While the UPP’s dissolution may be a short-term loss for democracy, it can be seen as a long-term gain for progressive politics. Both the left and the right have a case in the Lee Seok-ki debate -- but both sides are overlooking crucial facts.